This was the most ambitious tour we have yet embarked on comprising a total of 15 vehicles, which included one motorcyclist. In the coming weeks you will get to understand the amazing group dynamics and how the whole group became a solid unit in the short space of just 4 days. Part of this can be attributed to the quality and IQ level of the group as a whole and their ability to function efficiently, compassionately and unselfishly as a strong unit. There were doctors, vets, pathologists, engineers, pilots, farmers, businessmen, IT specialists and a few retirees and four children under the age of 15. At the first briefing the group was advised that the challenge was going to be tough on mind, body and soul and that the event would require a high level of staying power to get it completed. The challenge is not easy which is why only 40% of those that enter manage to complete it. The group was split into two groups - Mike (guided by Mike Leicester) and Romeo (guided by myself). Mike group also included the lone motorcyclist Francois van der Westhuizen with his wife Eileen riding pillion. Francois would ride ahead of the group. This meant each group effectively comprised 7 vehicles including the team leader. Group Mike would start at 0700 and Group Romeo at 0730 on day 1 and then swap on each alternative day. The first day was long - very long. At almost 400 km the route included 4 of the Ben 10 Challenge Passes. This meant arriving back after sunset with a bone weary group who eagerly descended on the pub and a hearty dinner served up by the Mountain Shadows Hotel team, who catered to our every need - including 0600 breakfasts. Keeping a careful watch on the local weather (which showed rain for Day 3), Mike and I decided to switch Day 3 with Day 2. We also decided to clip off the southern part of the route (which included Langeni Pass, All Saints Neck and Satans Neck passes) to give our guests a comfortably short day for Day 2. This proved to be a very wise decision. 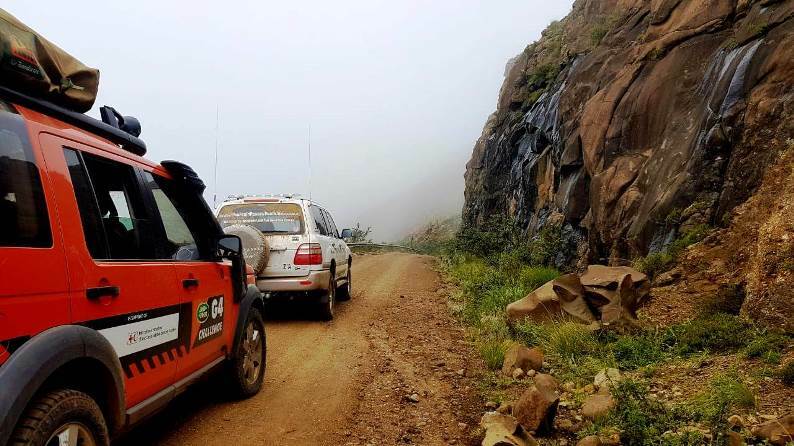 The anchor pass for Day 2 was the Bastervoetpad Pass which had received persistent rain the previous 24 hours and was a slick, muddy track, which would test driver skills to the core. The G4 Land Rover Discovery picked up a double set of sidewall cuts courtesy of a cracked concrete pipe, in the first kilometre and had to abandon the attempt and return to base making use of his spare and a can of Tyre Weld. Our intrepid motorcyclist fell multiple times ascending the pass and sensibly decided to abandon the attempt shortly after the summit. His wife has decided to rather get a lift with Mike which would make the ride easier for her husband. The Land Rover effectively blocked the road at that stage and soon another group of 5 vehicles stacked up behind our group and within another 15 minutes group Mike arrived making the traffic jam 20 vehicles long. Yet another group of vehicles arrived behind group Mike, adding to the congestion. Bastervoetpad lived up to its name as being the most technical pass in South Africa, with yours truly ending up 90 degrees across the track on one occasion and having to deploy the front diff-lock to extricate the Land Cruiser. Tyres were coated in a thick mousse of sticky mud, effectively rendering even the chunkiest treads to slicks. Some of the steeper sections were a question of allowing the vehicles to slide and not bothering too much with trying to steer. Richard Heathcote (sweep vehicle in group Mike) unselfishly shepherded the hapless Land Rover back to Elliot for tyre replacement (and those were brand new tyres to start with). A rapid change in plan had to be implemented with Group Mike having to be absorbed into group Romeo for Day 3, whilst Mike, Richard and Francois would return the following day to pick up the bike on the back of Richard's Land Cruiser bakkie. Fortunately Richard had driven Bastervoetpad on his way to the start, so he already had that pass ticked off. 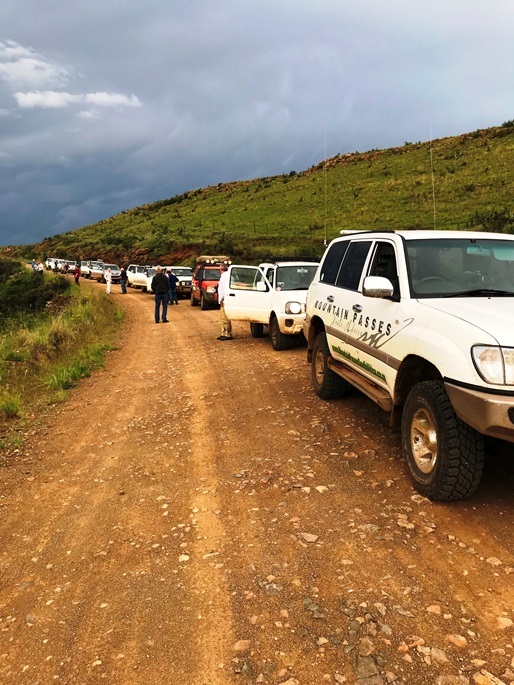 Day 3 - Group Romeo (now 13 vehicles strong) headed up to Naudes' Nek pass from the southern end, then drove Carlisleshoekspruit Pass and Volunteershoek Pass, before returning to base. This included a detour via Ballochs Pass and Wintersnek to see the famous rail reverses and Loch Bridge before arriving after 6 pm back at the hotel. Another long and tiring day, but without any hassles - mechanical or otherwise. The recovery team successfully managed to collect the motorcycle, but Francois sensibly elected to get a ride with Mike for the rest of the tour as the multiple falls had taken their toll on his body. Day 4 left the convoys in much the same format. Mike would take Richard, Francois and Eileen to complete 5 of the challenge passes in one day to play catch up, whilst your scribe would lead the same group as Day 3 over the final 2 challenge passes. It was supposed to be the easiest and shortest day of the 4. This proved to be the exact opposite. All we had to do was the TTT (Tiffindell Tenahead Traverse) - an easy but slow 2.3 hour contour road (the highest contour road in SA) followed by the short and steep switchback peppered Ben MacDhui pass. A giant electrical storm system had been building all day, so we decided to head directly up the mountain and leave the festivities and celebrations at Tiffindell for later. Group Romeo (13 vehicles) crawled their way to the top of Ben MacDhui without issue, except at the final little climb up to the summit plateau, which had had been severely damaged by other vehicles before us. It started raining, then hailing and soon things descended into chaos. Lightning crackled down in great flashes juxtaposed by a menacing black sky. One bolt earthed on the RSA/Lesotho fence sending sparks flying - just metres away from one of our guests. Meanwhile the Suzuki Jimny got stuck on the final obstacle, which required a recovery with hail and rain pelting down - not the best conditions for managing rational decisions! We then got 2 x 200 series Land Cruisers up as well as a Fortuner, but the 76 Series Land Cruiser buried its rear axle over a big rock which required some road building. The black clouds had completely encircled Ben MacDhui at that stage and it was clear that a major storm was about to break. Long bolts of lighting were getting ever closer with loud rumbles of thunder promising really heavy weather on the way. 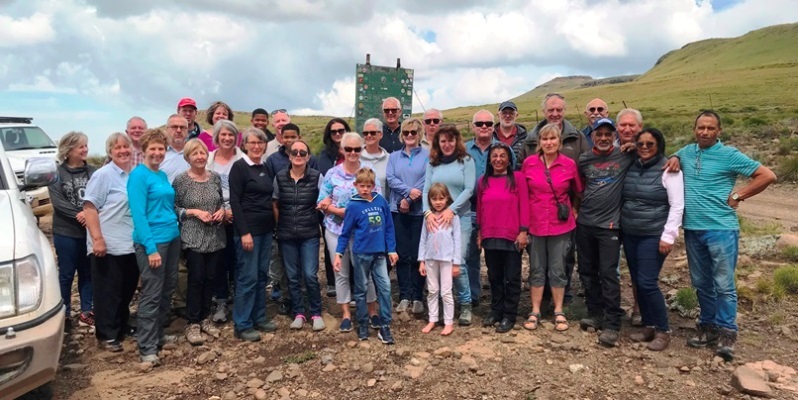 A safety decision was made to abandon the rear half of the convoy's assault on the summit and drivers were asked to quickly walk to the beacon to take their summit pics, then head down immediately down to the safety of Tiffindell. On the way down the Land Rover slid into a ditch, which required a tug-recovery. Finally we had everyone down safely and the Ben 10 Eco Challenge had been successfully completed by 2.30 on Sunday 24th March. The mood was jubilant. 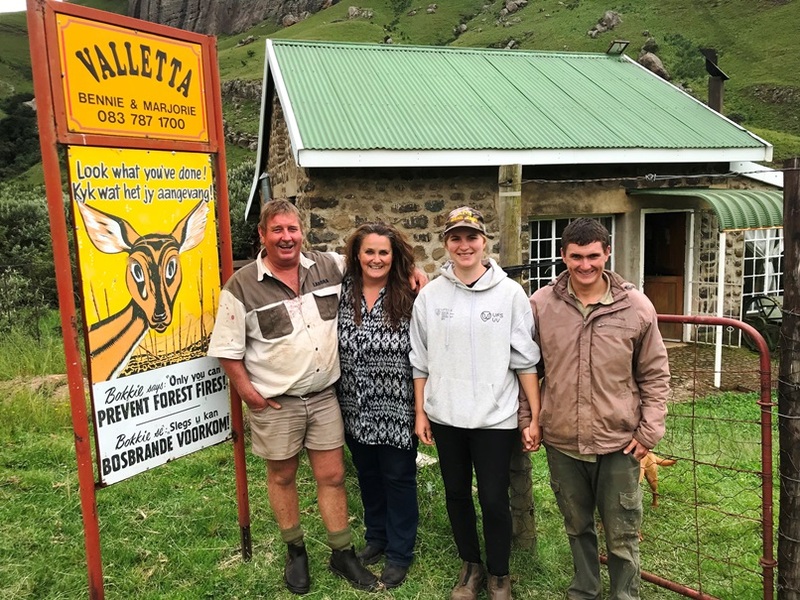 Tiffindell treated our group to coffee, cakes and cheese in their pub 'Ice Station 2720' and all that was left was an easy drive back to Mountain Shadows Hotel. But Mokholo was not quite done with us yet. The biggest challenge of all lay in wait for us. Whilst descending Carlisleshoekspruit Pass the slender waterfall visible on the descent was now a raging torrent of brown water cascading down into the valley. An ominous warning that our celebrations were premature. With an increased sense of urgency the big convoy edged down the pass to the first river crossing which was already flooded and flowing strongly. The gravel sections were becoming dangerously slippery. The first three vehicles crossed without issues and radio comms were relayed to those at the back using the little Suzuki Jimny as the scratch vehicle, which managed all the crossings without any issues. By the time the third crossing was reached, things were starting to look a little wild and the gap between the Suzuki Jimny in position No.4 and the Land Rover in position No.5 opened up considerably. The rain was pelting down as was the hail. Nature was in full battle cry and we were at the receiving end. In a few short minutes, a safe river crossing rapidly deteriorated into a dangerous one. In the time it took the first 4 vehicles to cross the third river crossing, it suddenly rose by almost half a metre. This is where the Land Rover drowned, with surging flood waters rising up to windscreen height. The engine also cut out mid-stream. Panic and pandemonium ensued with the Land Rover having to be recovered from behind. The stricken Land Rover was then towed across the river (which had rapidly subsided), but less than 1 km away the main bridge over the Carlisleshoekspruit was completely under almost a metre of water. A dead cow drifted past in the churning brown waters. Flood waters were steadily rising to encircle the main barn next to the river. We started moving vehicles to higher ground. We were in trouble, but alive. The convoy was halted whilst the predicament was analysed and assessed. Within an hour, the water levels began receding and soon the surface of the old bridge was exposed, but the temporary bridge alongside was completely washed away. This meant assessing the risk of crossing the old bridge without its supporting columns, which is where our civil engineer came into the picture. We all crossed safely, but the Land Rover was left at the farm, with our sweep vehicle, driven by Mark Ilbury, being able to accommodate the 4 shaken occupants of the Land Rover. But the day was not over yet. The Isuzu bakkie showed an alternator fault, no doubt due to water ingress. It was getting dark and we still had over 100 km to travel on flood damaged gravel roads. The skies darkened as great flashes of lightning encircled us. The Isuzu would have to drive without lights to conserve battery power for the fuel pump, so the vehicle behind had to drive offset with brights on to show the way. It was a long gruelling drive at around 40 kph with the whole group finally arriving at 10 pm that night. The hotel staff had waited up for us (as had the barlady) providing a wonderful end to an amazing adventure. The Land Rover was low-bedded to Aliwal North where it is currently being assessed for water damage and the Izuzu made it to Aliwal on it's own steam after an overnight battery charge at the hotel. We learned some new safety lessons on this trip and with hindsight, we should have halted the whole convoy before the first river crossing and waited for water levels to subside. From a raging torrent to a manageable stream in just one hour. We will be serialising this story in detail on our FaceBook page over the next week or so. Check it out.